Yesterday went by in a blur and I forgot day 6! Pretty packaging. A joyful, fun, creative way to add that seasonal touch. I haven't used "store bought" pre-made wrapping paper in years. You know, the sparkly foil and stuff. 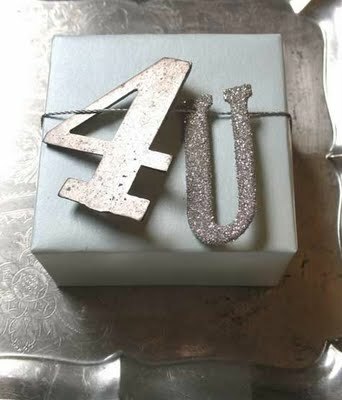 Using neutral, natural paper like newsprint, brown kraft wrap or just plain white paper allows you to add little embellishments with lovely, personal results. I know, that sparkly foil and stuff have their place in the "workshop" so I'm not talking about that. 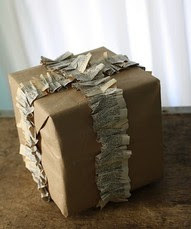 It's also a great way to recycle that old newspaper and next time you go to the local grocery store ask for paper bags and you'll get those brown kraft paper bags for wrapping! When my nieces and nephews were younger I made gingerbread initials for each of their packages but these are really lovely for those grown up gifts. There are recipes for making cinnamon/glue cookie ornaments but gingerbread cookie recipes work really well and are edible. 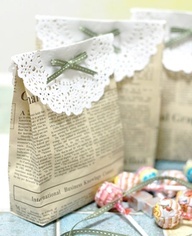 Lovely little paper bag packages. If you don't have ribbon, use strips of fabric. You don't have to buy stamps - remember potato stamps? This one takes a bit of sewing but what fun. 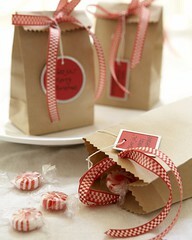 Handcrafted goodie bags. The instructions for making these bags can be found here. They are in another language but the pictures are worth a thousand words! This year, these great little ice cream containers made pretty little packages for my great nieces. Handcrafted gift tags tied with seam binding and a bell. Simple. 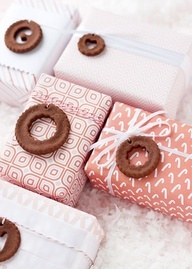 Even if you don't have gifts to give - nothing says you can't put together faux packages to use for decorations under a tabletop tree or pile in a basket. Take some time to make those ever so carefully thought about gifts say happy holidays. Enjoy.